Following the concert in Port Chester, NY, Tears for Fears will head on to Morristown New Jersey to perform at the Mayo Performing Arts Centre. Tickets for this show go on sale the 29th of July – This Wednesday! – for Starlight Members of the Theatre. Tickets range from $79 to $150… This is a show with seats, not general admission. If you’re looking to get up close you’ll want a Golden Circle seat which are the first 4 rows in front of the stage. *There is onsite parking. You can pre-pay for your parking and skip the line if you wish. Read more by clicking here. Accommodations: We suggest using the hotels that the venue suggests such as The Hyatt Morristown as these are on our Travel Fan preferred list as well. Fan Fun: This show is right on the heels of another so right now the only thing planned prior the show is sleeping off the drive and early morning flights before the show. We will most likely go out to dinner and drinks afterwards but remember we have to be up in the morning for the next destination… Though none of us really sleep during these tours. The excitement is insane. 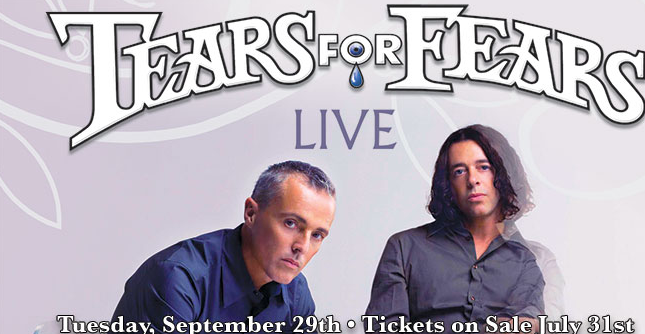 Update: *Tears for Fears Travel fans, contact us on FB re: tickets to sit together. *The box office opens at 10am ET in the summer…so call at that time perhaps if you have any questions. Meet and Greets – This is not a third party show. Contact the venue directly for any offers they may be making to special members. We’ll update this post as information becomes available! Thanks for visiting our Travel Fan Blog!